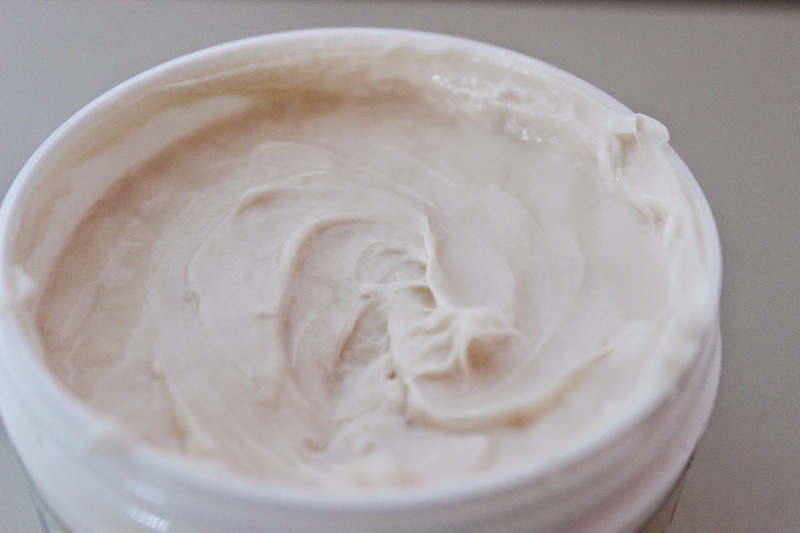 Whenever I think about Ouidad's Curl Recovery Melt-Down Extreme Repair Mask, two words come to mind: a lot. I won''t leave you hanging, so let's jump right in to this requested review. Availability: Like all Ouidad products, the Curl Recovery Melt-Down Extreme Repair Mask is available in Ouidad salons, on Ouidad.com, at Ulta (and of course, Ulta.com), and Curl Mart. Affordability: At $40 for 6oz, the price point is sure to be a turn off for many. I can honestly say it is the second most expensive product I've ever put in my hair. The most expensive is another Ouidad product, but we'll talk about that later. More full disclosure fun: I didn't pay for the Melt-Down Mask. If you read my Whipped Curls Review, then you know that Ouidad has sent me tons of stuff (showing the most major of loves) -- and it included the Melt-Down Mask. I'm glad they did, because every time I've walked into Ulta, I toyed with the idea of purchasing it. This definitely gave me the opportunity to try it out and help you all (and me) answer that tough question -- is it really worth it? Ingredient List: Water (Aqua), Cetearyl Alcohol, C12-15 Alkyl Benzoate, Stearamidopropyl Dimethylamine, Propanediol, Glycerin, Bis-Hydroxy/Methoxy Amodimethicone, Behentrimonium Chloride, Cetrimonium Chloride, Behentrimonium Methosulfate, Methyl Hydroxycellulose, Cetyl Esters, Cetyl Alcohol, Trichilia Emetica Seed Butter, Citrullus Lanatus (Watermelon) Seed Oil, Hydrogenated Castor Oil/Sebacic Acid Copolymer, Passiflora Edulis (Passion Fruit) Seed Oil, Euterpe Oleracea (Acai) Pulp Oil, Raphanus Sativus (Radish) Seed Oil, Tocopheryl Acetate, Oriza Sativa (Rice Bran) Oil, Disodium EDTA, Panthenol, Limnanthes Alba (Meadowfoam) Seed Oil, Quaternium-91, Simmondsia Chinensis (Jojoba) Seed Oil, Cetrimonium Methosulfate, Persea Gratissima (Avocado) Oil, Ethylhexylglycerin, C10-40 Isoalkylamidopropylethyldimonium Ethosulfate, Cocos Nucifera (Coconut) Oil, Dipropylene Glycol, Lactic Acid, Guar Hydroxypropyltrimonium Chloride, Butyene Glycol, Vanillyl Butyl Ether, Phenoxyethanol, Fragrance. Product Claim/Description: Melt-Down Extreme Repair Mask is a luxurious treatment with our proprietary CR-4 Repair Complex -- including nutrient-rich Mafura Butter and Kalahari Melon Seed Oil -- that envelopes the hair with a cushion-like coating of concentrated fatty acids vital to rebuilding, nourishing, and protecting hair. A blend of three clinically-proven actives instantly recreates hair's depleted lipid barrier, restoring the protective layer to promote health and prevent future damage. Unique melt-down technology pampers hair with a subtle warming sensation as it replenishes moisture. Performance/Delivery: Remember when I used the phrase "a lot" to describe this product? Let's get to that. By the ingredient list, you can obviously see where the phrase applies there. Because I'm not strictly a juices and berries natural, I don't get turned off by complex scientific names, so long as I can find some sort of way to understand what they mean. We've already covered the "a lot" of words and money part, so there's that. Let's get to the good part: my feelings, which this mask has me all in. Before writing this review, I made sure to use the ENTIRE jar to develop an informed opinion. $40 is a lot of money, and I wanted to make sure my experience was consistent enough to answer the question of it being worth the money. At first sight and smell, the Mask appears thick and has a similar sweet perfumey fragrance along the same lines as Whipped Curls. I just knew that based upon consistency, I would get a good two uses out of this jar. That turned out to be wrong. I got at least 5 deep conditioning sessions out of the 6oz jar (it may very well be 6, but I could only solidly remember 5). That alone shocked me -- although the Mask is thick, it spreads really easily throughout the hair. A little scoop that you think will only cover a small section of hair turns out to cover like half. I also noticed while spreading it through my hair, it went from being thick to frothy. I didn't experience the warming sensation, but I must say the workability of the Mask through the hair is quite awesome. It really "melted" into my hair! The Mask works well, with or without heat. The directions say to leave it on for 10-15 minutes, and throughout the course of emptying the jar, I experimented with longer times, exact time, heat, and no heat. 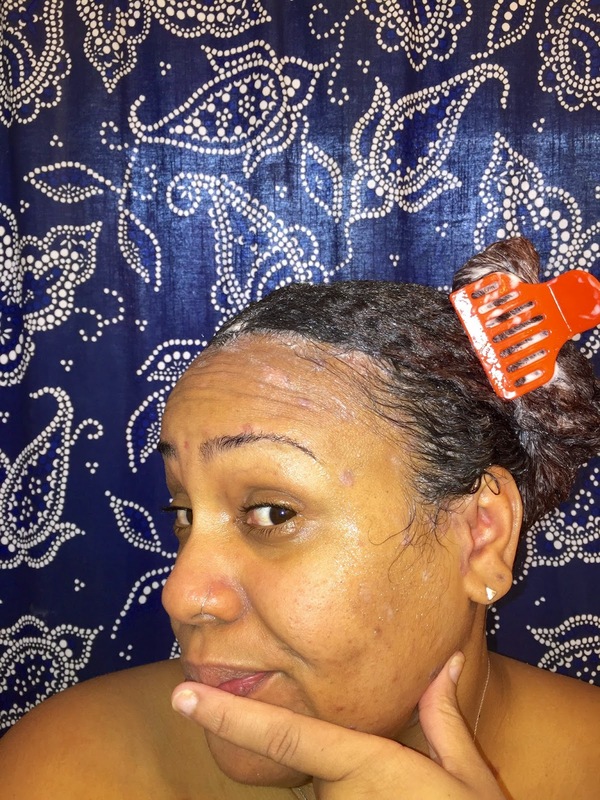 The mask works well any way, which makes it one of those deep conditioners you can count on in a crunch. Now let's get to what you really want to know -- my hair after rinsing. Shine bright like a diamond is an understatement. My hair was shiiiiiiny! Like, amazingly shiny. It felt stronger, heartier, and like my hair had taken up all the goodness that tiny jar had to offer. Drawbacks: Without a second thought, the price to quantity ratio. As you all know, I can (and have in the past) be a little splurgy with deep conditioners and curl definers -- but this nearly takes the cake. $40 for 6oz is just really unappealing to me. Perhaps if the jar were 16oz instead of 6, I'd feel better about it. Bonuses: I really do like the fact that it feels like the Mask literally melts down and absorbs into my hair. It's an elasticizing treatment that definitely delivers on the promises of curl elasticity, manageability, softness, shine, and healthy vibrancy. My color treated curls definitely appreciated it. I also enjoyed getting more than 2 uses out of the jar. Bottom Line: Do I sound torn and confused in this review? Because that's exactly how I feel. You know me -- I am always here for a good deep conditioner, and doubly here for a product that performs as it says it will (and triply here for exceeding expectations). 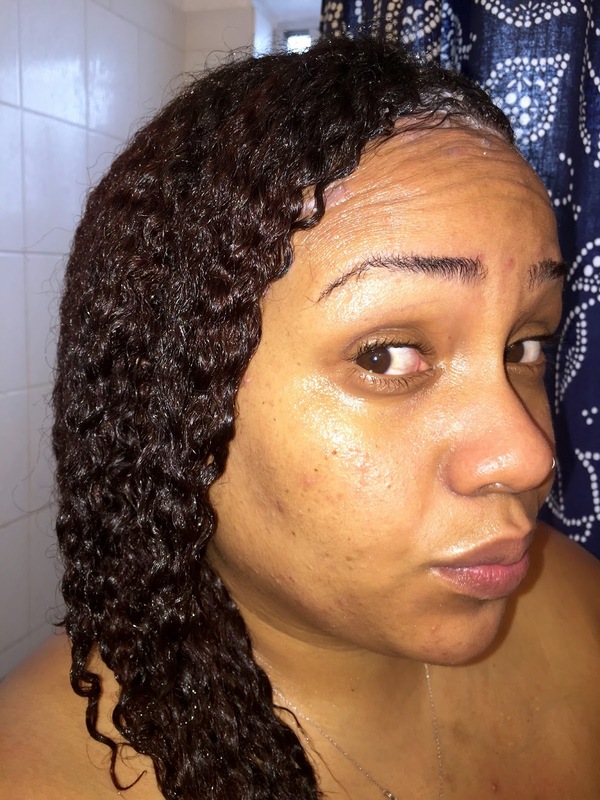 Ouidad's Curl Recovery Melt-Down Extreme Repair Mask is alladat. But this price point? You're killing me, Larry. If this mask were half the price, I'd automatically file it under must-have in the blink of an eye. I really am having an emotional tug-of-war with this product. On one hand, the performance is almost flawless. On the other hand, the price tag equates to a full tank of gas (thanks, Obama). Normally, at this point I'd either be encouraging you to try it for yourself, or telling you to skip it. I can't confidently say one or the other. I think the only thing I can say with some assurance is that if you do decide to splurge on it, I'm pretty sure you'll love it. There isn't another deep conditioner (that I know of) like it. The closest comparison I can draw is ApHogee's Texture Treatment -- and even that's a stretch. You know what? Here we go --let's call it an occasional splurge. If you every-so-often like to treat your hair to something nice and new, make it the Ouidad Curl Recovery Melt-Down Extreme Repair Mask. Buy it for your curls at Christmas or something. Spending $40 every once in a blue moon won't hurt -- but adding a product like this to your weekly deep conditioning rotation most certainly will. There we have it -- if you're an occasional splurger, the Mask will work well in that regard. Overall Product Rating: 3.5 stars. I want to give it 4.5, but there are a few things that pull Ouidad's Curl Recovery Melt-Down Extreme Repair Mask down. The obvious givens are the price point and amount of product. I am also a little bothered by the fact that all of these nutrient-dense oils that comprise the CR-4 complex and more are listed as ingredients 14 - 20, and 21 - 24. I would have liked to see a little bit more of those (especially the kalahari and mafura) in the top 5 - 7 ingredients. The product itself performs at a solid 4.5, but those other factors bring it down some. Best Practices: Always apply the mask to wet hair. Scoop a little into your hand and rub your hands together to get the "melt-down" action started. This helps facilitate that ease of spreadability that allows you to not use 3/4 of the jar in one deep conditioning session. Whew, this was a tough one. 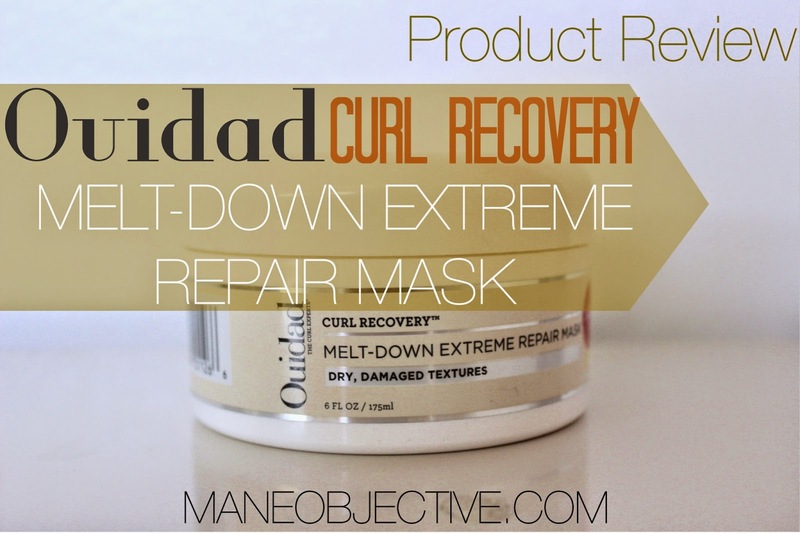 Will you be splurging on Ouidad Curl Recovery Melt-Down Extreme Repair Mask anytime soon? ARGH!! Christina! What are you doing to me??! Based SOLELY on this review, yes I will try it, BUT only if I can catch it on sale. I absolutely get the splurging occasionally, but even so, $40??!?? 6 oz?!? Nah son. I loved your review though! As I was reading I did think of the Aphogee Texture Treatment; loved that you mentioned it. LOL! Did you feel my pain coming through this review though? And what is worse, is that because it's a prestige product, coupons and sales don't apply toward it at stores like Ulta. You have no choice but to catch it on sale directly from Ouidad. I'm trying out this mask right now from Zotos Professionals 180Pro line (it's at Sally's) for under $10. I'll be doing a review and be sure to let you know if it's a viable alternative to this one! Thank you! I was so torn! I hated using it so much because I didn't want it to go away quickly...lol. I have one more jar, and you better believe I'm going to stretch it ALL the way through 2015! I can pay an utility bill with that money. I am just waiting for Sally's Beauty to create the GVP brand for $10.00. Sale....If you find it, we will come. You are the foremost product junkie enabler, Christina. There are two things stopping me here. The price and the size. I've been known to splurge on the occasional luxury product, but it's got to be a large tub of something ON SALE. I've never seen this on sale but I'll keep my eye open. It is £34 at the only UK supplier. I just spent that on 500ml of Philip Kingsley. Now that's a bargain. Great review as always. I look forward to your reviews. Keep them coming. LOL!! IKR? Curlmart just had a 20% off sale, but hell even then it was $32 for SIX OUNCES OF PRODUCT. It still may take me a minute to wrap my head around it. I know HauteLook sometimes has the Ouidad Co-Was at 40% off; wonder if they also have the DC? I'm definitely going to be on the lookout. Hahaha! I ABSOLUTELY felt your pain; like literally, you didn't want to love it (because of the price), but you did. It is what it is. I'll definitely be on the lookout for sales from Curlmart, and maybe HauteLook. They carry the Ouidad CoWash, but I'm not sure about the DC. Looking forward to the Zoto review. I told Christina on Instagram that I have one jar that I am holding on to for dear life or the Zombie Apocalypse. It came in a Curlbox last year and I treat like it is an Emmy Award.